I was given an opportunity to review Math Analogies Level 1 from The Critical Thinking Co. 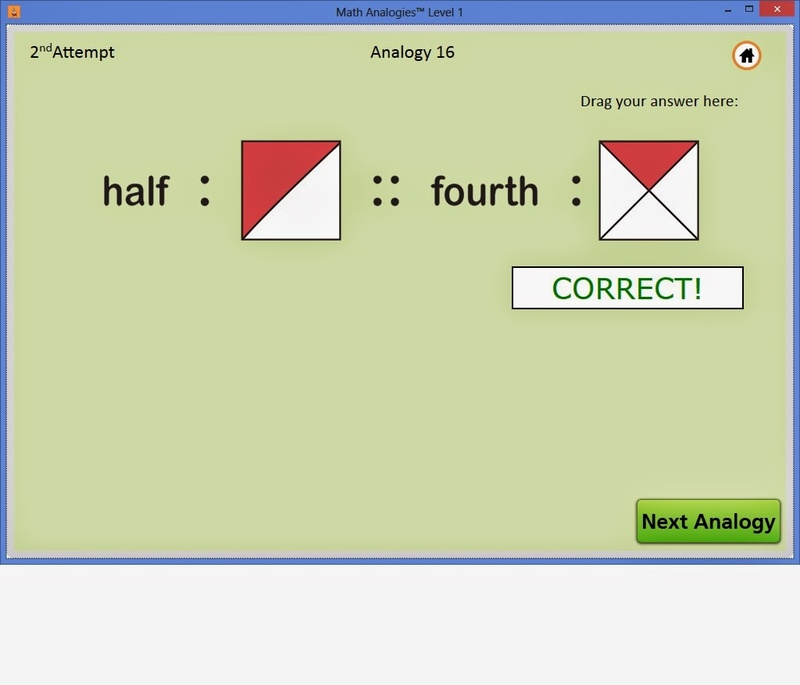 Math Analogies Level 1 is a software program recommended for grades 2-3. When I first heard "analogies", my mind immediately went back to high school and taking the SAT. Analogies focus on similarities between items, a form of logic requiring critical thinking skills. How appropriate that it's sold by The Critical Thinking Company. Math Analogies Level 1 contains 152 questions. Each question offers 4 choices for the small person to choose from to answer the analogy. Once a choice is made, the program offers immediate feedback on whether it was correct or incorrect. There is a link on the home page on "How to Solve an Analogy" that a student (or parent) can click on to get further instruction if it's needed. It walks them step by step through the thinking pattern needed to answer the questions. After going through all 152 questions, the small person gets a 2nd attempt on the questions missed the first time through. If any questions are missed that time through, then those questions will be offered on a 3rd attempt. They get a total of 4 attempts to try missed questions. Sassy is really good at math; in fact, she's first grade age working on second grade math. I'm always looking for things to challenge her, and this definitely fit that description. The first time, I sat down with her and explained how analogies work and how to figure out the correct answer. After that, she was able to work on it on her own. Since the program is designed for 2nd-3rd grade, there were some concepts that she hadn't gotten to yet, but after a few tries, she was able to figure them out. Having to teach 4 other children, I really liked that about the Math Analogies 1 program. If you have a child that needs a little more coaching, though, it would also be doable with you sitting next to them helping them think through the problems. Sassy worked on the program for 15 minutes on Mondays, Wednesdays, and Fridays for a few weeks. She worked through the 152 problems in just a few days, including having to do several problems on the 2nd and 3rd attempts. Once she had finally gotten all of the questions right, she asked if she could do it again. So we hit "Restart" and she started all over again - not just once but twice! She really enjoyed using this program. We received this as a program to download, so once I downloaded it, it's ours forever. No further purchasing is necessary; no renewals, etc. It is available to purchase as a download for Windows, Apple, and Android. It is also available in book form. The Critical Thinking Co. offers Math Analogies at a variety of levels. There are levels for K-1st, 4th-5th, and 6th-7th. You can find out more about those and some other Critical Thinking Co. products by checking out some of the other Review Crew reviews.